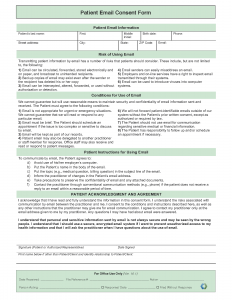 These forms and templates have been provided health care practitioner use. If you choose to use a form and will have patients send it electronically by email, only use secure, encrypted email or post to secure websites that meet recommended security protocols. Otherwise, you will put your patient’s privacy at risk and you will accept unnecessary liability. Please remember that the use of these standardized forms and templates comes with a responsibility for ensuring that the documents accurately reflect your practice and your compliance responsibilities. Compliance requirements differ based upon practice type, size, needs, and activities. If you don’t know whether you comply or how to comply, please consult a qualified attorney – don’t guess. Health care practitioners who merely copy or use forms without integrating them into their practice and harmonizing them with their HIPAA Policies and Procedures face significant financial risks. If you doubt those risks, at least one hospital paid a huge fine for copying another hospital’s work without sufficient thought. The policies and procedures didn’t fit actual practices. If you need help creating or updating your HIPAA Policies and Procedures and have questions about HIPAA compliance be sure to review the other HIPAA sections of the website and get in touch with us for additional help. Your HIPAA Policies and Procedures should reflect your actual practice policies and procedures. Developing policies and procedures takes some time and effort – there is no escaping this work. In addition, you need to annually review these policies and procedures to make sure they match changes in the law and in your health care practice. You can find hundreds of examples on the internet to help you in this effort. If you choose to copy another practitioner’s policies and procedures, make sure you follow them because you will be responsible for complying with your adopted policies and procedures. Visit our practice services page for information about more comprehensive services. Below you will find forms commonly needed to meet HIPAA privacy and security requirements.